In 1930, not quite a year into the Great Depression, my great-grandmother, Jennie Molleur, hopped a trolley into the City of Springfield, Massachusetts. Her mission was to buy the latest technology for her family. It was technology that would bring all the world had to offer into her living room. She was getting a ‘talking machine’. She left the trolley in the downtown shopping district on Main Street entering Forbes & Wallace Department Store. She decided on a Brunswick Model P-13 radio (talking machine). The price was $85, the deal was on installments, so a $1.76 ‘carrying charge’ was added. What impresses me about this move is that the radio’s total cost of $86.76 is equal to $1,158.24 in today’s money. The average annual income in the United States in 1930 was about $1,600. This one purchase would account for six-percent of a family’s yearly income. In this case, my guess is the percentage was higher. 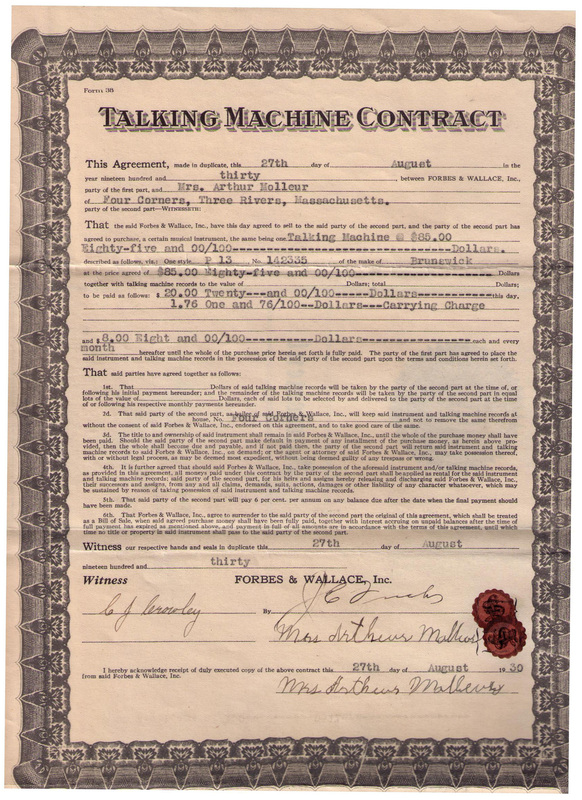 Sales slip for the talking machine. This certainly was a major buy, especially so because America was nearing the nadir of the Great Depression. Ecomomic havoc was evident all around. Yet on August 28, 1930, ‘Mrs. Arthur Molleur’ committed to paying almost $90 dollars to get this new gadget in her home at $20 down and $8 per month. On the contract she agreed to ‘keep said instrument and talking machine record at your house…and not to remove the same therefrom without the consent of Forbes & Wallace Inc’. The radio was officially a lease to own. 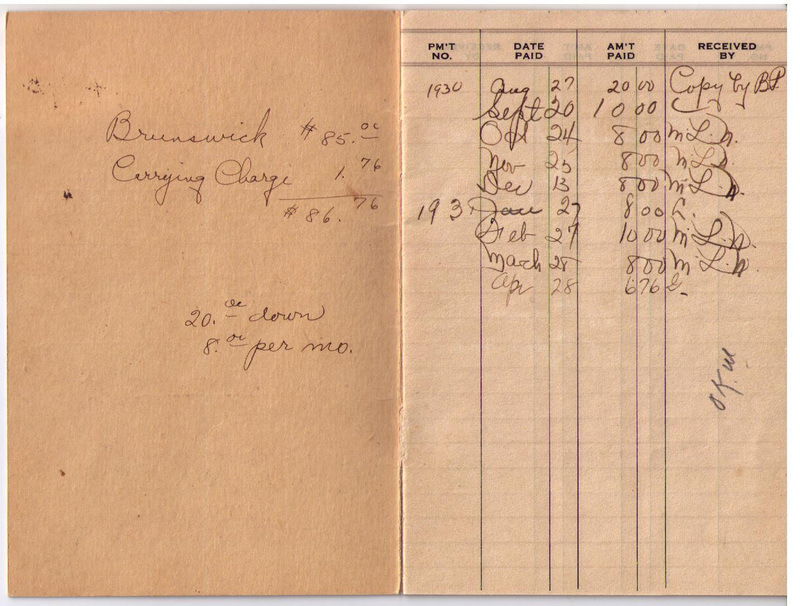 The last payment was made April 28, 1931. To give this some perspective, at the time gas was 25-cents a gallon, a loaf of bread was 9-cents, milk 14-cents a quart and steak 49-cents a pound. The United States Unemployment Rate, which was 8.7% in 1930, would jump to 15.9% a year later. By 1933 it stood at 25%. Receipt fot $20 down payment. Radio was still relatively in its infancy. 1930 witnessed the first radio broadcast from a ship at sea. Locally WBZ radio was broadcasting out of East Springfield in the Westinghouse Building on 990 AM, WTAG 580 in Worcester and WORC 1200 in Auburn, MA were among the nearest stations to their Three Rivers home. This was also the heyday of clear channel stations which could broadcast sometimes to half the country due to very low interference from other radio stations, or for that matter electrical interference in general. It was not unusual for listeners to tune into to station hundreds of miles away from their location. 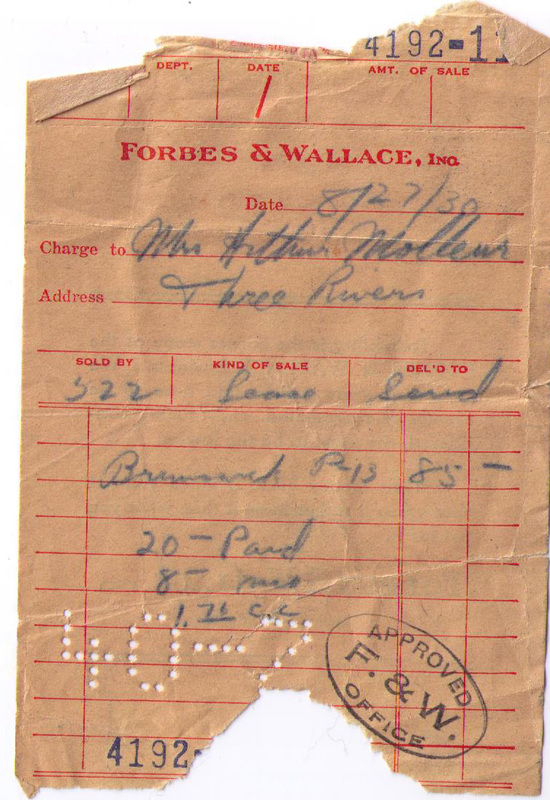 Forbes & Wallace payment book. Note left hand side lists the price of the ‘talking machine’ (Brunswick), the carrying charge, down payment and monthly payments. A purchase at this time of uncertainty says a lot about those making it. These French-Canadian immigrants had confidence in their country. They had built their home with their own hands. There was a confidence in the future. The number one song in America in 1930 was, ‘Happy Days Are Here Again’. They would hear about the beginning of scheduled transcontinental air service, the discovery of Pluto and of the efforts of President Herbert Hoover to stem an increasing sense that many would not find work again. 1930 saw the Nazi Party pick-up 107 seats in the German election. The talking machine would tell them of the rise of the Nazi Party and its seemingly dynamic leader Adolph Hitler. He would become a major part of radio programing. As a young girl my mother remembers tuning in to hear what Hitler sounded like. The talking machine was the internet of its day. Entertainment, news and time filler. In the case of my great-grandparents, this purchase was probably a reach that was well worth it. Posted on January 6, 2014, in Business, entertainment, history, Life, media, Radio and tagged antique, family, Forbes & Wallace, Great Depression, Herbert Hoover, history, ma, massachusetts, radio, springfield, technology, Three Rivers, trolley, united states, vintage, wbz, WORC, WTAG. Bookmark the permalink. Leave a comment.